Formed not long after the NZ Race Relations Council, was a Maori radical organisation that would have a lasting impact on this country. In August 1970, Auckland University academic, Ranginui Walker organised a Young Maori Leaders Conference in Auckland. Some of the more militant attendees used the conference to form a new organisation to push for Maori self determination. Originally called the Maori Liberation Front, the name was soon maorified to the more ethnically correct, Nga Tamatoa, (Young Warriors). Nga Tamatoa members on the steps of Parliament. 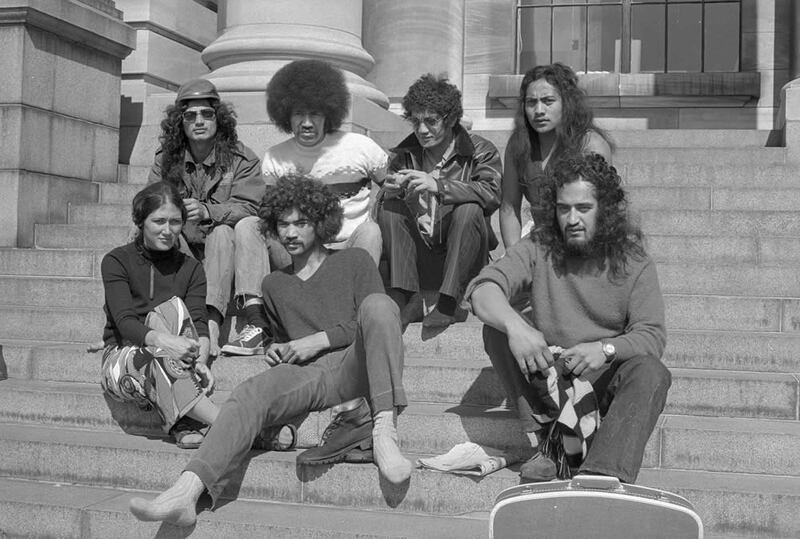 A young Tame Iti, top right. Nga Tamatoa's ideology was Maori nationalist, with a strong undercurrent of Marxism. As leading member, Donna Awatere told Broadsheet of July 1982. 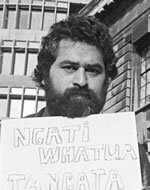 "[I] spent hard committed years working with Nga Tamatoa, thrilled to Marx's economic theory..."
In 1977 Nga Tamatoa activist Rawiri (Dave)Ruru outlined his group's philosophy at a talk at Victoria University on the fight for Maori Rights. "During the late 1960s and early 1970s there was a world awakening to the evils of racism and the attendant oppression. Sure, the issue was highlighted by groups like the Black Panthers and the American Indian Movement, but even in New Zealand in the 1960s and early 1970s the evils of racism were being exposed by groups like Maori Organisation On Human Rights and the anti-apartheid movement. Nga Tamatoa's basic policy revolves around opposing racism in New Zealand and on the International front. As a group, however, our efforts have been centred primarily around fighting against the inherent racism and oppression of the systems which operate in New Zealand. That is, the education system, the judicial system, the economic system, the system of land tenure, and the system of law enforcement.... The only way that we are ever going to get racial equality in New Zealand is by uniting with other oppressed people and fighting to destroy the various systems that oppress us. If one identifies and understands the struggles of oppressed people, one realises there is a common enemy - and that enemy is the capitalist system that operates here in New Zealand... What is really required in New Zealand is not a rash of new laws but a basic change in peoples attitudes - and that starts right from birth. It doesn't start when kids get to school and discover that we have a very racist and capitalist-oriented education system in New Zealand. What is required is a strong socialist party that can identify the issues and that will commit itself to fighting to overcome and destroy the present capitalist system and replacing it with a socialist system that is just and that cares about people." Nga Tamatoa cadres worked with several of New Zealand's Marxist-Leninist parties, some even signing up as members. 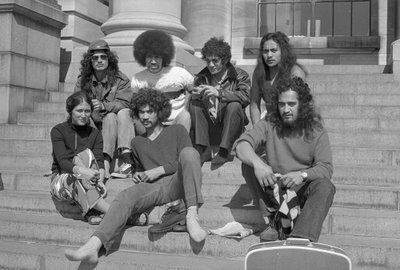 Activists such as Titewhai Harawira, Barney Pikari and John Tahu had links with the Socialist Action League, while others such as Taura Eruera, Zac Wallace, Ripeka Evans, Syd Jackson and Donna Awatere associated with Socialist Unity Party members. Others still, such as Tame Iti and Cora Davis had Maoist connections. Davis, for example travelled to China in 1971 with the first of several NZUSA sponsored delegations to the People's Republic. Most of the delegation were Maoists, including Graeme Clarke, future leader of the Workers Communist League and Mike Law of HART and the NZ Race Relations Council. Nga Tamatoa was a breakthrough organisation. It became the first Maori radical group to have a significant influence on public opinion, however it's achievements weren't so obvious at the time. Writing in Marxist journal, Sites (Summer '88) Ranginui Walker, boasted of his young protege's successes. "Few people will remember that they (Nga Tamatoa) initiated Maori Language Day, a nationwide petition that culminated in the introduction of the Maori language into our primary schools, a one year teacher training scheme for native speakers of Maori, and a legal aid system in the courts to assist young Maori offenders. Fewer people still will make the connection between Tamatoa and the establishment of the Waitangi Tribunal." The same old pattern. Socialist groups putting forward policies that eventually become the law of the land. Although Nga Tamatoa folded in the late '70s, many of it's cadres are still leaders of various strands of the Maori/Marxist struggle.